Two of the most perennial topics in art and literature throughout human history, love and hate, in their multifarious forms and contexts, have always appealed to a large number of readers and audiences. Not only inspiring thousands of works of art and literature, but also giving birth to genres and sub-genres, love and hate have been essential elements of all popular cultural forms, including music and cinema. American literature and culture are no exception in terms of its keen interest in this binary. Some cultural critics have even pointed out the uniquely American way of dealing with matters of the heart. For instance, both Henry Adams in the well-known “The Dynamo and the Virgin” chapter of The Education of Henry Adams, and Leslie Fiedler in Love and Death in the American Novel, have pondered, with a critical tone, why American society has always been uneasy with the topic of love. Whether it is an uneasiness, as Adams and Fiedler claim, or another distinctive characteristic that distinguishes love in the United States, this conference hopes to stimulate discussion about representations of love, and its antitheses, in the American context. 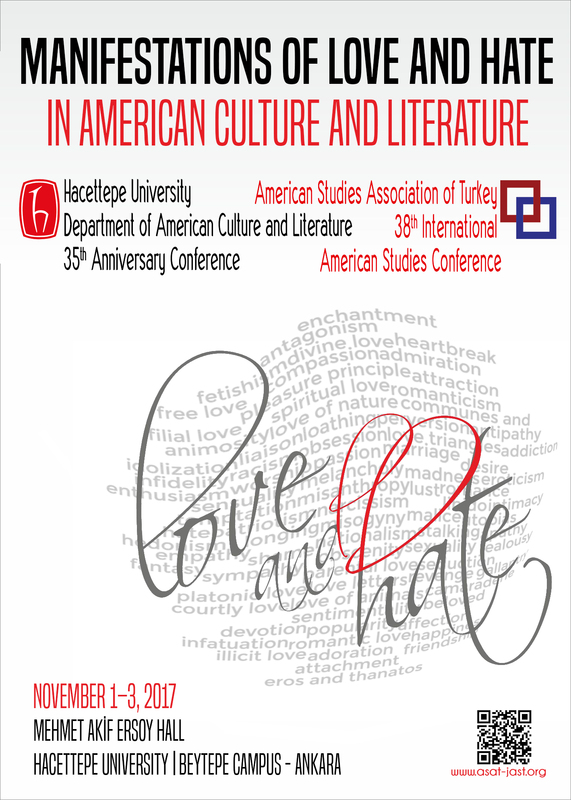 Proposals should be sent to the American Studies Association of Turkey ( info@asat-jast.org) and should consist of a 250–300 word abstract, three to five keywords, as well as a short (one paragraph) biography for each participant. The time allowance for presentations is 20 minutes. An additional 10 minutes will be provided for discussion. While the conference language is English, we will accept a limited number of abstracts in Turkish for a Turkish-language panel at the end of the conference. All presenters residing in Turkey must be/become ASAT members. Selected papers will be included in a special issue of the Journal of American Studies of Turkey (JAST) based on the conference theme.